What causes acne? Clogged pores. So how do pores get clogged in the first place? You may not have noticed, but your skin is completely covered with hair and your sebaceous glands are constantly producing oil. The oil that is produced is drawn to the roots of the hair follicle. The oil attaches itself and travels up through the follicles, emerging on the surface of your skin. This is your skin's natural protective lubrication. However, sometimes oil gets trapped on the way up to the surface of the skin, and that's when the problems begin. 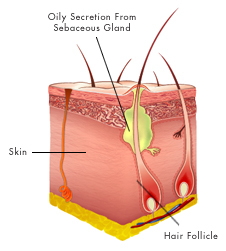 As oil gets stuck in the follicle, it gets caught up with dead skin cells. The combination of the oil and dead skin cells form clumps that cause the hair follicle to close. The surrounding tissues of the closed pores then become irritated, bacteria develop, and swelling occurs. This inflammation is known as a pimple or pustule. As skin cells, bacteria, and oil increase inside the inflamed pore, the pimple usually erupts. However, most of us don't let a pimple get to that stage before we pick at it. Unfortunately, this habit can lead to increased infection, scarring, and/or pitting. While it is best not to pick, avoid using your fingers or fingernails if you can't resist. Instead, use two Q-Tips and gently squeeze. While there are all kinds of treatments for acne, many of the products on the market are very drying and serve to aggravate the skin further. Typical dermatology practices using antibiotics only achieve control of acne in 60% – 70% of cases. At Art of Skin Care, complete control of acne is achieved in over 90% of cases, including severe acne. We utilize unique antibacterial ingredients such as cinnamon extract, sage extract, turmeric extract, wild marjoram extract, mandelic acid, and salicylic acid. In addition to very effectively eliminating acne bacteria, these ingredients have multiple functions. Cinnamon extract, for example, blocks the action of 5 alpha-reductase, as does green tea. These ingredients reduce sebum production and prevent the development of new infections. Green tea and wild marjoram down-regulate the production of interleukin-6 and tumor necrosis factor-alpha, which causes the inflammation that promotes new acne infections. Zinc found in mineral clay also blocks 5 alpha-reductase as well as interleukin-6 and tumor necrosis factor-a. Zinc is essential for healing and repair and is an essential ingredient that promotes quick and complete healing.